This was a plain white box which a decorated with lots of ribbons (they are all from Crafty ribbons) and some orange pearls from my stash. I also used Spellbinders circle and scalopped circle dies. I drew the bat myself on a piece of black cardstock, cut it out and glued it on the orange circle. Aren't these ribbons just great?! If you want to win them, just participate in our challenge here. :) You have til 12 October to link your creation(s) to the challenge. Good luck! Brilliant Cebelica! I love the gems! Fab little box Cebelica, love the colours. Wow, Cebelica this is brilliant what a fab project, super design and love the ribbon, super. 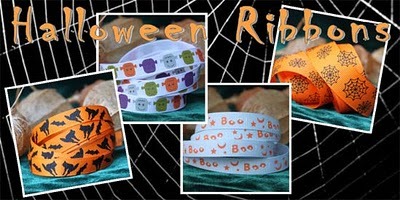 Love the bats and fantastic ribbons. Brilliant project.